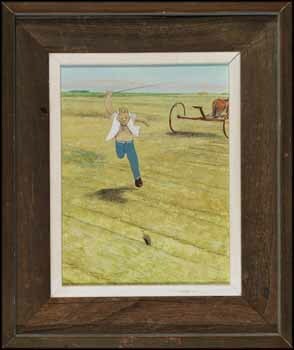 initialed and dated 1972 and on verso titled and inscribed "70"
William Kurelek's memories of his childhood and youth spent on the family farm gave him volumes of rich material to use as subjects in his art. 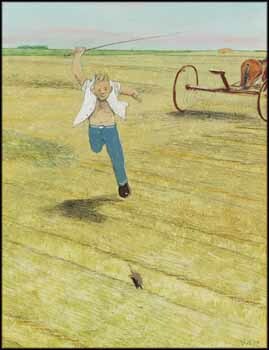 These scenes, especially the playful ones such as Mouse in the Hayfield, often bring smiles of shared delight to the faces of viewers who have similar memories of their own. Indeed, it is hard not to grin when one looks at the gleeful expression on the face of the young man in this painting, who pursues the mouse with a horse switch as his only weapon at hand. Hair flying, shirt open, he bolts across the golden field, while the horses, indifferent to why they have stopped pulling, are halted at the edge of the work. The young man's balled fist echoes his intent, and while it seems unlikely that one can eliminate a mouse with a switch, his determination seems such that the mouse could soon meet its end.